The Kentucky lady’s slipper orchid (Cypripedium kentuckiense C.F. Reed) is a tall, stately perennial plant with large, attractive flowers. Its range includes much of the southeastern United States, though it is rare throughout its range due to specific edaphic and climatic habitat requirements. This effort is to restore one of the most spectacular orchid’s native to the region. Kevin Allen, a high school student, located a flowering orchid in the Kisatchie National Forest, caused it to be pollinated, and later collected a fertile seed pod. A collaborative effort began between Spangle Creek Labs, KNF, Southern Research Station (SRS) and Central Louisiana Orchid Society (CLOS) to restore the orchid on appropriate sites in the national forest. Grants from the Southwest Regional Orchid Growers Association and the U.S. Forest Service have allowed CLOS to purchase plantlets grown from the collected seed pod. A number of articles have been published from the research effort to restore the orchid. The most recent research and complete documentation of the efforts was published in the Summer 2012 edition of the Native Plants Journal. This article is posted below with permission from the authors. The Kentucky lady’s slipper orchid (Cypripedium kentuckiense C.F. Reed [Orchidaceae]) is a tall, stately, perennial plant with the largest flowers of any known native Cypripedium (Figure 1). Its range includes much of the southern US (USD A NRCS 2012), but it is now endangered and rare throughout its range and populations continue to decline. In Louisiana, only a few plants are located on 4 sites within the 242,811-ha (600,000-ac) Kisatchie National Forest (KNF). This effort, to restore one of the most spectacular orchid’s native to the region, began with the initiative of a 16-year-old, high school student. As a student and amateur botanist, Kevin Allen, located a flowering orchid on the KNF, caused it to be pollinated, and later collected a seed capsule. 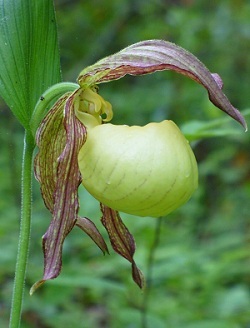 He sent the seed pod to Spangle Creek Laboratory in Bovey, Minnesota, who are specialists in producing lady’s slipper orchids; they determined the seeds were fertile. Allen approached KNF botanists with the idea of producing plants for reintroduction efforts on the KNF. Not having expertise in growing orchid seedlings to plantable size, KNF botanists approached the Forest Service Southern Research Station and Central Louisiana Orchid Society (CLOS) for help in evaluating the potential for producing stock suitable for restoration efforts (Barnett 2008). Thus began a collaborative effort to develop protocols for producing Kentucky lady’s slipper orchid seedlings with potential for reintroducing them into the KNF. Here we describe our efforts, successes, and failures and provide some suggestions for future research work in establishing this plant. The Kentucky lady’s slipper is a terrestrial orchid, in contrast to the epiphytic nature of the plants most orchid hobbyists grow in their greenhouses. It is a tall, stately perennial plant with the largest flowers of any known Cypripedium. 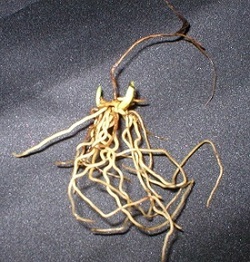 Underground rhizomes allow the plant to undergo periods of dormancy. The stems are erect; range from 3.5 to 8 cm (14 to 32 in) tall with alternate, broadly ovate leaves about 15 to 20 cm (6 to 8 in) long that have conspicuous parallel veins (Berkshire 2011). The flowers, usually one or two occurring on the stem terminals, have cream-colored lips, yellow-green with spotted or mottled maroon sepals and petals. The lips are large and have a dorsal opening characteristic of lady’s slippers (Figure 1). The habitat of Kentucky lady’s slippers is usually mesic to dry-mesic forests on stream floodplains, ravine slopes, and acid steep forests. They may occur as well on forested springhead seeps in sandy soils (Berkshire 2011). Indicator species for Kentucky lady’s slippers (Allen and others 2004, Megyeri and Allen 2011), American beech (Fagus grandifolia Ehrh. [Fagaceae]), eastern hophornbeam (Ostrya virginiana (Mill.) K.Koch [Betulaceae]), horsesugar (Symplocos tinctoria (L.) L’Hér Symplocaceae]), and witch hazel (Hamamelis virginiana (L.) [Hamamelidaceae]) in the overstory and an abundance of poison ivy (Toxicodendron radicans (L.) Kuntze [Ancardiaceae]) and broad beechfern (Phegopteris hexagonoptera (Michx.) Fée [Thelypteridaceae]) in the understory, were present on the site selected for this study. protocorms for 2 separate trials following the methods of Steel (2007), briefly described next. orchids’ requirements were supplied in an agar medium. Steel (2007) found that different species of orchids, even within the same genus, may require media of different nutrition composition. Both agar media and seeds require sterilization, otherwise the cultures would quickly be overcome by competing organisms such as fungi and bacteria. Steel (2007) has established procedures for sterilizing Cypripedium orchid seeds without adversely affecting germination. After 3 to 4 months on specialized media within flasks, the embryos swell, rupture the seed coats, and bodies known as protocorms were formed. Flasks were kept in darkness to encourage root rather than shoot growth. After germination and initial development, protocorms were transformed from the germination flasks to fresh media in another flask for further development. 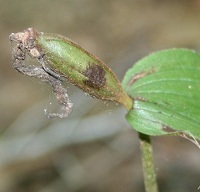 Many species of Cypripediums require chilling to hasten germination and shoot development (Curtis 1943). Because Cypripedium kentuckiense has a more southern range than most Cypripedium species, extent of seed or protocorm dormancy of this species is not fully understood. Upon removal from flasks, the protocorms were thoroughly rinsed with a small amount of water. Although unsure of the need for lengthy chilling, containers with the seedlings were then placed in a refrigerator for several months to assure the seedlings are properly vernalized (Steel 2007). Protocorms must be transplanted into a greenhouse or nursery environment for growth to a plantable size. This transition from in vitro conditions requires a significant period of acclimation. (approximately 1:1:1 by volume). The 200 plantlets received in late May 2006 were distributed to several growers within the CLOS in an attempt to determine guidelines for consistent production. Although initial shoot growth was excellent (Figure 4), survival of plantlets during the next several months was poor. temperature resulted in mortality or seedling dormancy. Plants were found to perform better in partially shaded outdoor environments. commercial potting mix (Promix®) and sand (2:1 ratio by volume) were used by growers, and plants transplanted into trays in mid-April were grown in shaded outdoor conditions. Survival percentage in the trays at the end of the growing season greatly improved—to about 60%. We outplanted seedlings 3 times: 18 December 2007, 10 March 2008, and 30 December 2008. 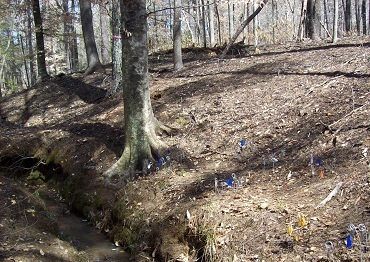 Seedlings were outplanted in in the Catahoula Ranger District of the KNF (Figure 5) on a site chosen along a stream near a small group of native Kentucky lady’s slipper orchids (Barnett and others 2012). Before outplanting, the number of roots and shoots of each seedling were measured and recorded (Figure 6). Procedures for outplanting followed recommendations developed by Cullina (2011) for planting divisions of Cypripedium plants. The procedure involves working compost or litter from the location into the planting site. A cavity was then made into this soil, the root system placed so that the bud was level with the groundline, and the soil was replaced around the root system. The site was then covered with mulch to protect the plant and conserve moisture. At the time of outplanting, the 2006 crop averaged 6.5 roots and 1.0 shoots, whereas the 2007 crop averaged 8.3 roots and 1.3 shoots. We planted 4 replicates of 5 seedlings for each age group (2006 and 2007). We measured survival after 4 (April 2008), 7 (July 2008), and 17 (May 2009) mo. Although 4-mo survival was relatively good, seedling mortality was high after 7 mo in the field (Figure 7). Rapid increases in seedling mortality were likely related to droughty conditions at the planting site. Too, at planting, the seedlings were small with poorly developed root systems. Steele (2007) reports lack of success in growing Cypripedium arietinum seedlings held in any sort of peat-based mix for longer than one season. seedling vitality, that was not particularly evident in the survival data. We had 4 replications of 5 seedlings in each of 2 treatments: control (no fertilizer) or fertilization accomplished by scattering 5 grams (1 teaspoon) of Osomocote®19-6-12 (slow release, Scotts Company, Marysville, OH) around each plant after the seedlings were planted. At the time of outplanting, seedlings averaged 8.25 roots and 1.25 shoots. We measured survival after 1 (April 2008), 4 (July 2008), and 14 (May 2009) mo. Seedling mortality was high after just 4 mo in the field regardless of treatment , probably for the same reasons suggested above. We assumed that some level of fertilization would help seedling growth and potential flowering, but had no data as base for application rate. The lower survival noted for fertilized seedlings at each observation date would suggest our rates were too high. positioned the apical bud about 1.25 cm (1/2 inch) below the surrounding soil surface whereas deep planting placed the bud about 2.5 cm (1 inch) below surrounding the soil surface. In both cases, the bud was at the surface to the soil in the planting hole. We measured survival after 5 (May 2009), 16 (April 2010), and 28 (April 2011) mo. After 5 mo, survival averaged 92 and 62% for shallow and deep planting, respectively, but after 2 y, survival was poor was regardless of treatment. These results indicate the superiority of shallow planting of these small seedlings. Apparently, they lacked the resources to overcome deeper planting. In nature, the orchid root system is shallow, growing only in the top 2.5 to 5.0 cm (1 to 2 in) of soil (Stoutamire 1991), thus optimum planting depth may depend on the size of the root system. Results when using larger planting stock may vary. The overall poor survival after 1 and 2 y is likely influenced by the extreme droughty conditions at the planting site. It has been long established that orchid seeds require associated mycorrhizal fungi for germination under natural conditions (Curtis 1939). It makes sense, and others have observed, that these plants have long-term mycotrophic needs (Zettler and Piskin 2011). The specific fungi related to the germination, establishment, and growth of Cypripedium species have not been determined. The development of seed baiting technology, however, provides an approach to identifying fungi specific for Cypripedium kentuckiense(Brundrett and others 2003). 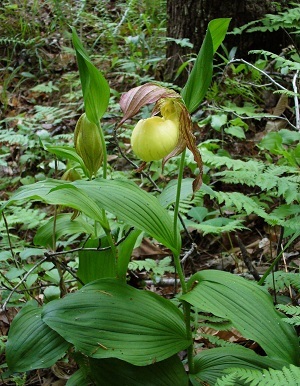 It is important that the plants are inoculated with the appropriate fungal association to successfully reintroduce Cypripedium species into the native habitat. Until the clarification of these relationships is developed, a practical approach to inoculate seedlings with the most appropriate fungal genera is to collect soil from sites where native populations exist. This soil can be distributed to the potting soil used for orchid production. was not properly replicated, the results showed that survival of seedlings held in a greenhouse for 6 mo improved from 35 to 52% due to inoculation treatment. Our results indicate that collection of mature capsules will provide highly viable seeds and that in vitro germination and development of protocorms on an appropriate nutrient based agar is feasible. The acclimization of plantlets to southern in situ conditions remains a significant challenge. From our seedling acclimation work, we conclude that (1) greenhouse temperatures in Louisiana summers were excessive for growing these terrestrial orchids, (2) seedlings developed well in dappled-shade outdoor environments, (3) a peat-sand mix that maintains a moist but well-aerated medium worked well for initial plant development, (4) seedling growth during the first growing season seldom exceeded that obtained in the first few weeks after transplanting, although limited nutrients may have contributed to this lack of continued growth, and (5) seedlings should not be held in the same tray or pot for more than one year before outplanting and nutrients should be added to the potting media to stimulate plant development. 1. The outplanting site is important. Although presence of Allen and others’ (2004) indicator plants is a good starting place, other considerations are important, particularly availability of soil moisture. The site used in this study was droughty, the entire region experienced a severe drought during the study and this is likely one reason for the poor results. 2. Season of planting affects performance. The comparison unfertilized seedlings planted in December 2007 and March 2008 indicate that planting late in the seedlings’ dormant season resulted in higher initial survival than when planted earlier in the dormant period (85 versus 50 percent). 3. Age was not important. Extent of seedling development is more important than the age of the plants. The seedlings held 2 years in trays did no better than those held 1 year, but they were only slightly larger. Better cultural practices may have improved both size and performance. 4. Fertilization at planting was detrimental. Applying nutrients at planting was not successful in overcoming the same size of the planting stock. Apparently, the rate of application was much too high. Nutrients applied to the plants during the acclimation period in pots should result in more successful in seedling establishment. 5. Depth of planting is important. Seedlings planted with roots only slightly deeper than another treatment survived less well. 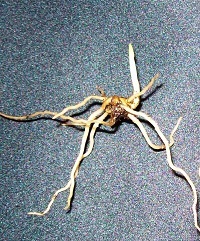 In both treatments the bud was only slightly covered, but the total root system was deeper. Apparently, debris and soil washed into the planting holes and covered of the seedlings reducing performance. 6. Inoculation with mycorrhizae is important. An important aspect of seedling acclimation that enhances seedling development and planting success is inoculation with fungi specialized for orchids. Results of research with other mycorrhizae-depending orchids show that establishment is significantly enhanced when seedlings have mycorrhizae-infected root systems (McCormick and others 2012). equipped to germinate seeds and produce large numbers of developing protocorms. Allen will use his honor’s chemistry students to develop procedures that result in consistent production of quality seedlings. Plantlets will be grown from protocorms in garden situations and on sites near native populations where active orchid regeneration is occurring. Seedlings of various stages of development will be produced to use in outplanting trials. fungal inoculation, and selection of improved planting sites will continue. In addition, a grant from Southwest Regional Orchid Growers Association supported Allen’s travel to Lawrence Zettler’s laboratory at Illinois College for training on seed germination and identification of mycorrhizal associations. Zettler is a leading authority on orchid seed baiting and identification of fungal genera associated with specific orchids. Until seed baiting techniques can be used to identify fungicidal associates, mycorrhizal inoculation will be accomplished by mixing soil collected near native populations with the potting mix. Once appropriate fungal associations are identified, studies will be conducted to determine the implications of fungal inoculation to seed germination, seedling development, and outplanting establishment and development. for propagating native orchids, including Cypripedium kentuckiense(Richards and Cruze-Sanders 2010). Our overall objective remains the same: develop protocols that will facilitate the production of Kentucky lady’s slipper orchids on a scale that will allow significant reintroductions of this rare orchid to the Kisatchie National Forest (Figure 7). Figure 7. Development of protocols to produce these spectacular lady’s slipper orchids in quantities that will allow reintroductions into the KNF is the goal of this effort. (Photo courtesy of Jeff McMillian @ USDA-NRCS Plants Database). 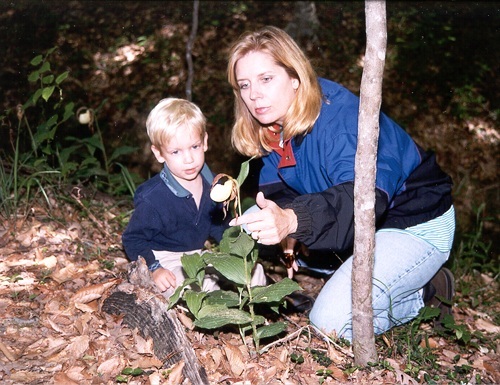 Central Louisiana Orchid Society member Connie Guillory and her son Stephen observing Cypripedium kentuckiense in situ. For additional information on this project, see the Rare Orchid Restoration Project article on the USDA Forest Service website. Allen CM, Thames S, Trichell S, White J. 2004. A quantitative study of the vegetation surrounding yellow lady-slipper orchid (Cypripedium kentuckiense, Orchidaceae) populations at Fort Polk in West Central Louisiana. SIDA 21(1): 409-417. Barnett J. 2008. Helping the wild orchid bloom again. Forests & People 58(1): 4-5. Barnett J, Sharp S, Allen K, Scott A. 2012. Restoring the rare Kentucky lady’s Slipper orchid on the Kisatchie National Forest: A collaborative effort. In: Guldin JM, editor. Proceedings of the 15th biennial southern silvicultural research conference. Gen. Tech. Rep. SRS-__. Asheville, NC: U.S. Department of Agriculture, Forest Service, Southern Research Station. [In press]. (accessed 20 Oct 2011). St Louis (MO): Center for Plant Conservation. Brundrett MC, Scade AL, Batty KW, Silvasithamparam K. 2003. Development of in situ and ex situ seed baiting techniques to detect mycorrhizal fungi from terrestrial orchid habitats. Mycological Research 107: 1210-1220. Cullina W. 2011. Planting large and small yellow lady-slippers, Kentucky lady-slippers, and their hybrids. URL: http://williamcullina.com/articlesandblog.html (accessed 30 Nov 2011). Southport Island, ME. Curtis JT. 1939. The relation of specificity of orchid mycorrhizal fungi to the problem of symbiosis. American Journal of Botany 26: 390-399. Curtis JT. 1943. Germination and seedling development in five species of Cypripedium L. American Journal of Botany 30(3): 199-206. Dutra D, Johnson TR, Kauth PJ, Stewart SL, Kane ME, Richardson L. 2008. Asymbiotic seed germination, in vitro seedling development, and greenhouse acclimatization of the threatened terrestrial orchid Bletia purpurea. Plant Cell, Tissue and Organ Culture 94: 11-21. Huber AG. 2002. Mountain lady’s slipper (Cypripedium montanum): Establishment from seeds in forest openings. Native Plants Journal 3(2): 151-154. Martin D. 2010. Growing Cypripediums in containers. North American Native Orchid Journal 16(1): 4-12. McCormick MK, Taylor DE, Juhaszova K, Burnett RK Jr, Whigham DF, O’Neill JP. 2012. Limitations on orchid recruitment: not a simple picture. (Orchidaceae) in West Central Louisiana. Journal of the Botanical Research Institute of Texas 5(2): 843-847. Ramsey MM, Stewart J. 1998. Re-establishment of lady’s slipper orchid (Cypripedium calceolus L.) in Britain. Botanical Journal of the Linnean Society 126:173-181. Reed CF. 1981. Cypripedium kentuckiense Reed, a new species of orchid in Kentucky. Phytologia 48(5): 426-427. Richards M, Cruze-Sanders J. 2010. A practical and integrated approach to native orchid conservation and propagation at the Atlanta Botanical Garden. North American Native Orchid Journal 16(1): 35-30. Steele WK. 1995. Growing Cypripedium reginae from seed. American Orchid Society Bulletin 64: 382-391. Steele WK. 2007. Propagation protocol for ram’s head lady’s slipper (Crypripedium arietunum). Native Plants Journal 8(1): 58-64. Stoutamire WP. 1991. Central growth cycle of Cypripedium candidum Muhl. root systems in an Ohio prairie. Lindleyana 6(4): 235-240. [USDA, NRCS] USDA Natural Resources Conservation Service. 2012. The PLANTS Database. URL: http://plants.usda.gov (accessed 5 Jan 2012). Greensboro (NC): National Plant Data Team. Zettler LW, 1997. Orchid-fungal symbiosis and its value in conservation. McIlvainea 13: 40-45. Zettler LW. 2005. Nature’s fungal connoisseurs: new insights into the mysterious orchid-fungal association. Orchids 74(4): 292-297. leucophaea(Nutt.) Lindley: A comprehensive list to augment conservation. American Midland Naturalist 166(1): 29-39.
orchid,Platanthera leucophaea (Nutt.) Lindley, and a technique to prompt leaf elongation in seedlings. Studies in Mycology 53: 163-171.